Duh. Sorry, this blog is becoming a bit tutu laden lately. I also finished a second one, but I need to re-shoot it. 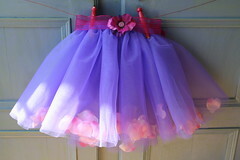 It's a new approach too, stuffed with tulle instead of petals for an extra poofy skirt. However, extra poofy means extra difficult to photograph, apparently. Next up -- Perhaps I'll be hanging all the art in my daughters room, and starting a mural in there. I say perhaps, as "we'll see." I cannot imagine how difficult it will be to paint on her walls with her dangling from my knee caps wanting to help. It may not happen. I will however, aim to hang the art, and take photos of it. I realized this afternoon - that aside from one cheapo bookcase and a cutesy toy chest -- I have altered, refinished, or created every item in there. I do hope that's a good thing??? And, rambling aside. Curtains. I need some of those!! I'll be making some tonight while the hubby entertains himself at a friends with some beer, er, um I mean, basketball. If you really want to do some "serious" tutu's, come to the tulle source. We'll both be happy you did. We stock 65 colors of tulle, and 41 colors of iridescent tulle. We'd love to add some of your pix to our web site at www.tulle.net. I saw a tutu in a little boutique in Texas and thought of you. They were way poufy- kind of had the feel of a petticoat that might be under a square dance skirt- but they were pretty cute and sold for $60! A woman bought two of them while we were in the store. I looove this!!! Just found your blog from Melissa (above)!